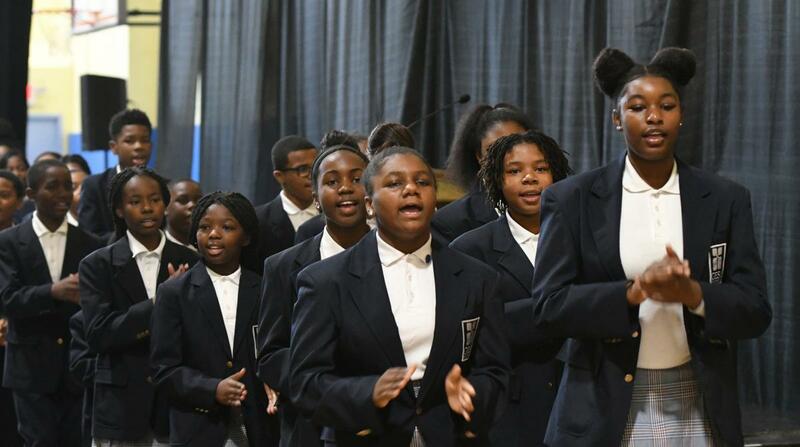 The Gesu Gospel Choir has been invited to perform at the 2018 Rittenhouse Tree Lighting! Come hear the voices of the choir usher in the holiday season and bring joy to our city at this festive event. We hope to see you there! Kate Bilo from CBS 3 and The CW Philly will host this special occasion. Comprised of over 40 students in 5th through 8th grades, the Gesu Gospel Choir performs at Gesu School events, such as monthly masses, our annual gala, and our annual Christmas concert in the Church of the Gesu. The choir also shares the gift of their voices in the wider community, including a retirement home at St. Joseph’s University. The choir’s holiday performances have been featured on multiple occasions on 6abc Action News and Fox 29. In 2015, the choir participated with regional choirs in a Revival at the outset of the World Meeting of Families and Pope Francis’ visit to Philadelphia, singing the prelude for an audience of hundreds. In 2014, the choir performed with the Grammy Award Nominated a cappella group Sweet Honey in the Rock at the Kimmel Center. Music Teacher H.L. Ratliff has served as Director of the Gesu Gospel Choir for more than 20 years and leads the choir in weekly instruction and performing unique arrangements of traditional and contemporary Gospel music. Enjoy the choir's voices on Gesu School's YouTube Channel!